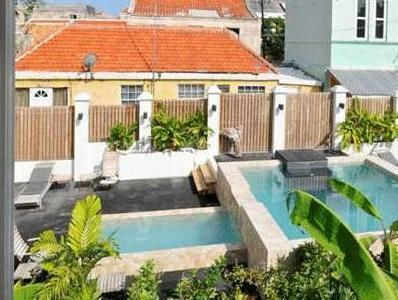 ﻿ Best Price on Pietermaai Boutique Hotel in Willemstad + Reviews! Located 66 feet from the Caribbean Sea, Pietermaai Boutique Hotel offers fully furnished accommodations in the historical Pietermaai district of Willemstad. It offers a charming garden with 2-level pool and terrace. Each bright apartment and studio features natural colors and wood-beamed ceilings. They also include a kitchenette. The apartments and studios are conveniently located next to restaurants and there is an on-site mini-market. The property is next to many propular attractions in Willemstad. Pietermaai Boutique Hotel offers free on-site parking. Please note, guests arriving after 20:00 will receive alternative check-in instructions. All photos presented show an example of what your booked room might look like. Guests are not able to pay in cash upon arrival. Only with debit and/or credit card. Please inform Pietermaai Boutique Hotel of your expected arrival time in advance. You can use the Special Requests box when booking, or contact the property directly using the contact details in your confirmation. A damage deposit of USD 250 is required on arrival. This will be collected by credit card. You should be reimbursed within 14 days of check-out. Your deposit will be refunded in full by credit card, subject to an inspection of the property.